There are names that form part of history and dates that represent milestones of our collective story. 110 years ago, between March and September 1905, the mailbox of the German scientific journal Annales der Physik received four papers that would forever change the laws of physics and, ultimately, our conception of reality: of light, of matter, of time, and of space. On June 9, 1905, Annales der Physik published the dissertations of the patent clerk about the photoelectric effect and the physics of light. “A heuristic point of view of the production and transformation of light” introduced the revolutionary idea that light is composed of both energy and particles: quanta for Einstein, photons for history. This concept that physical systems can behave both as waves (energy) and as particles (matter) would be the seed of one of the two pillars of modern physics: quantum mechanics. Sixteen years later, this theory of the photoelectric effect would take Einstein to the summit of science when, in 1921, he received the Nobel Prize for Physics. 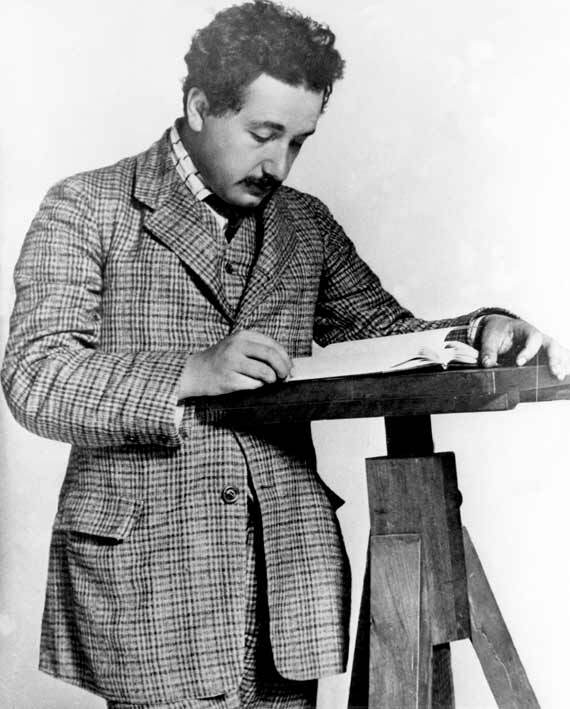 The second and the least important of the papers, published on July 18, was “On the movement of small particles suspended in a stationary liquid, as required by the molecular-kinetic theory of heat.” Although it did not revolutionize the principles of physics, nor earn him a Nobel Prize, Einstein found in a physical phenomenon (Brownian motion) empirical evidence of what many (but nowhere near all) scientists thought at the time, that matter is composed of atoms. In attempting to explain this curious phenomenon, Einstein not only mathematically confirmed the existence of atoms and molecules but, while doing so, he opened a new field in the study of physics, statistical physics. The third paper that year was perhaps the most groundbreaking. “On the Electrodynamics of Moving Bodies“ arrived at Annales der Physik on June 30 and was published on September 26, 1905. It presented the condensation of Einstein’s new physics in the well-known theory of special relativity, which preceded general relativity (which in 1915 also included the influence of acceleration and gravity). Einstein postulated in this paper that the speed of light is immutable, constant and independent of the observer’s movement. Therefore, except for the constant speed of light, everything is relative, including time, distance and mass. On November 21, the last of the four papers was published. “Does the inertia of a body depend on its energy content?” is, in effect, an epilogue of all the other papers. The mathematical proof of special relativity and, therefore, the confirmation of the equivalence between matter and energy, were condensed into the most famous equation in history: E = mc2. Fortunately or unfortunately, from E = mc2 was deduced the existence of a remain of energy in processes such as the nuclear fission of atoms. Terrified by the military applications and the use that the Nazis intended to make of them, in 1939 Einstein wrote a letter to Roosevelt, the President of the United States, so that the US would take the lead. And that letter ended up leading to the bombs dropped on Hiroshima and Nagasaki, forty years after Einstein’s annus mirabilis. “Newton, please forgive me,” Einstein once said, knowing that his advances questioned the foundations that the English scientist had laid in the seventeenth century. In fact, Newton also had his miracle year, since between 1665 and 1666, while sealed up in his house seeking refuge from the plague, he formulated his law of gravitation and his theory of color. But science is like this; for a breakthrough to be made, for a new idea to be confirmed, others have to be discarded. Perhaps a new scientific revolution will arrive that discards some of Einstein’s ideas, but his method will endure forever. The great merit of Einstein was in not trying to explain the results, the experiments themselves, but rather in developing a theory in which the experiment is the result and not the origin of a phenomenon.